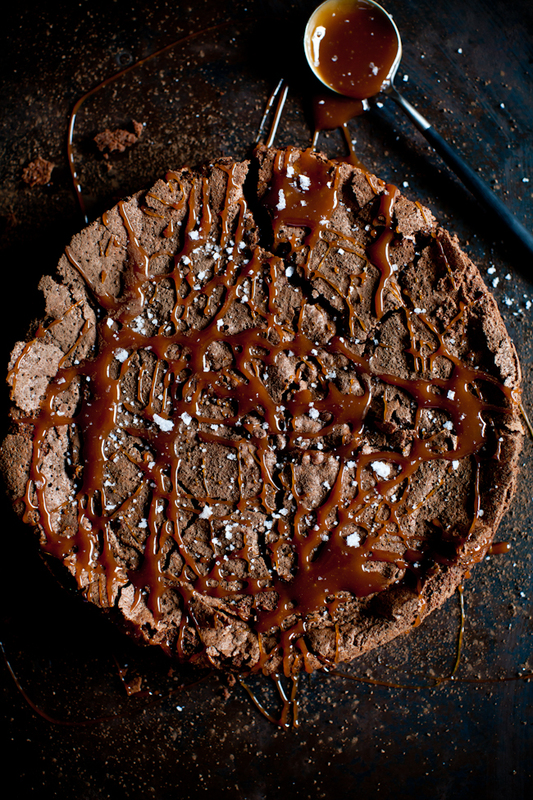 Tartelette: Flourless Chocolate Cake With A Twist. Flourless Chocolate Cake With A Twist. There are times you just want chocolate. Easter Sunday for example. I know it's already bee a couple of weeks since then but I still think about chocolate. And cake. You say Easter and it generates something of a Pavlov response in me. Easter meant roasted leg of lamb, green beans with lots of garlic, new potatoes and chocolate in my family. It also seemed to be my grandmother's favorite holiday, after Christmas. To this day, I still can remember the decorative chick and chickadees she would put in the middle of the table. The menu very rarely changed one year to the next and everyone would flock my grandparents' house for a long, well wined dinner. Oh did we cook! Stay tuned for more recipes and photos in the coming weeks! There are so many fun recipes and shots from that day that I really don't know where to start but I think a little chocolate can do everyone some good. In doubt, always start with dessert... This cake is completely flourless and a snap to make. It is from Martha Stewart and was my go-to recipe in my pastry chef days because it didn't require too many ingredients, thus very easy to remember. 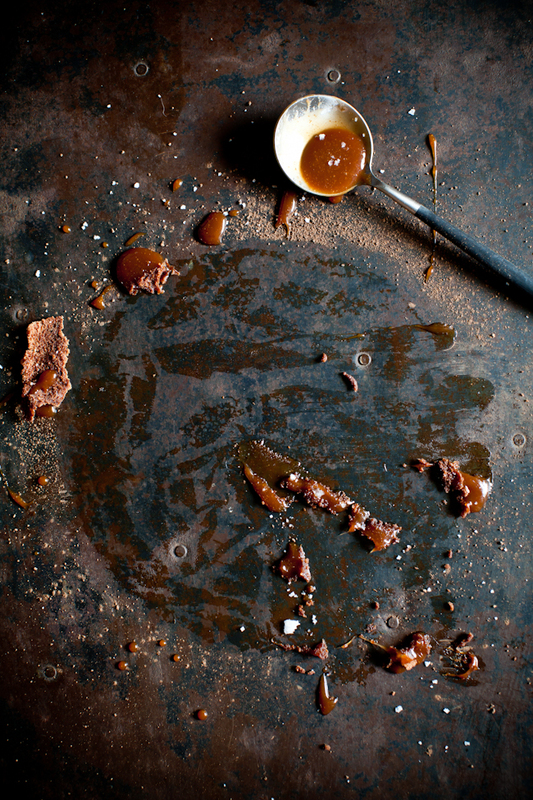 Served with salted butter caramel sauce. 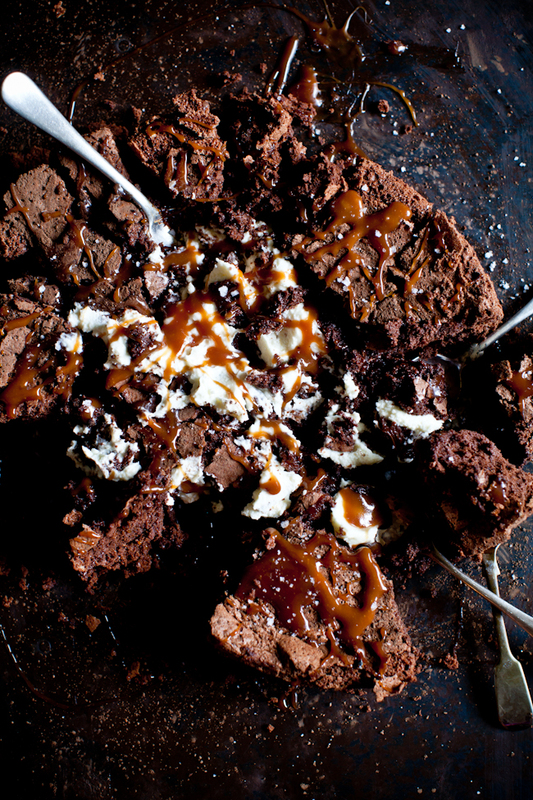 Because chocolate and caramel go together like blue skies and sunshine. I added a bit of cinnamon and black pepper (yes) to add some kick to it and end our Mexican night on a lovely note. We made two cakes, two different recipes, and one wouldn't unmold well so we decided to just dig in. A dollop of creme fraiche (or many), a few spoons and plenty of laughs and we were in business! Flourless Chocolate Cake, slightly adapted from Martha Stewart. Props and photos by yours truly, food styling by Nathan Carrabba. Directions: Preheat the oven to 275 degrees with a cooking rack in the middle. Spray the bottom and sides of a 9­inch springform pan with cooking spray (I brush a little oil instead). Set aside. Place butter and chocolate in a large heatproof bowl set over a pot of simmering water. Melt on low heat, stirring constantly. You could do this in microwave in 30 ­second increments, but I do not own one (personal choice). each time, until completely melted. Let cool slightly. Add the cinnamon, cardamom, black pepper and vanilla. Whisk in egg yolks. In a large bowl, or stand mixer with the whisk attachment, beat the egg whites until soft peaks form. Gradually add granulated sugar, and continue beating until stiff peaks form. Fold 1/4 of the egg whites into the chocolate mixture, do not worry about keeping air and volume. You are just trying to loosen up the chocolate mixture with the egg whites at this point. Now, gently fold in remaining egg whites, in two or three times. Pour batter into the prepared pan, and smooth the top with a rubber spatula. Bake for about 45 minutes, or until a knife inserted near the center comes out clean. Cool completely. 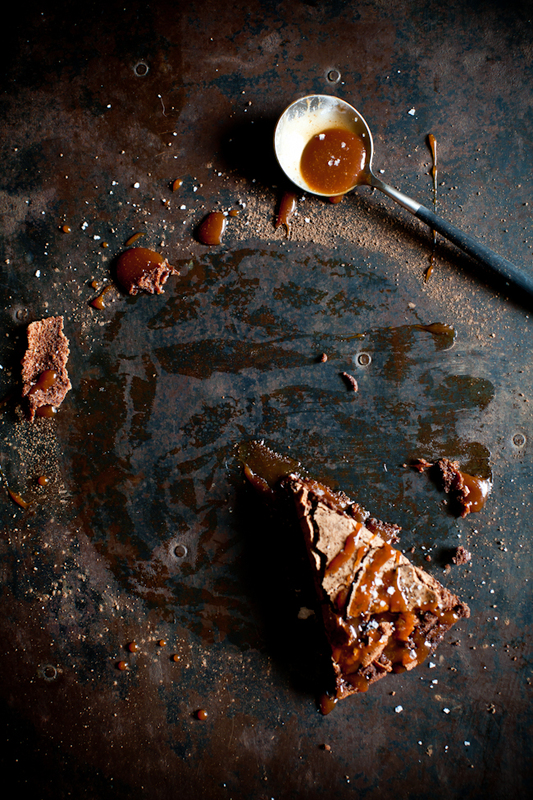 Remove from the pan and serve with caramel sauce or ice cream. In a heavy saucepan set over low heat, combine the sugar and water. Cook just until the sugar is dissolved. Add the butter. Let it come to a boil and cook until it reaches a golden caramel color. Remove from the heat and add the cream ( it will splatter and get crazy). Whisk to combine and put back on the stove. Let it come to a boil again over low heat and cook 10 minutes. That looks amazing! 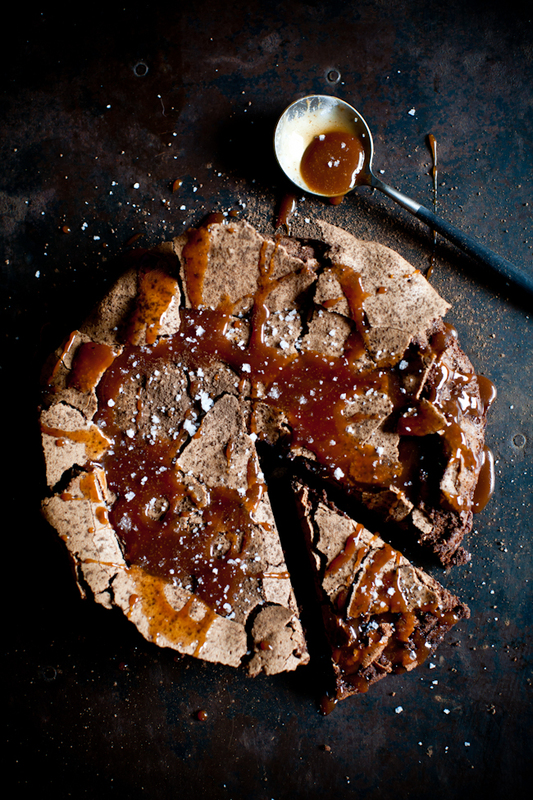 Flourless chocolate cake is always perfect :) Love the addition of caramel! I kind of just want to put my face in that cake smash photo. Looks so good! Wow-kay, this looks dangerously good. I'm definitely craving chocolate now. This looks amazing. I just drool over your photos and look at your book when setting up my own photos. Thank you for sharing. Looks so lovely! Can't wait to try it out...though, I'm wondering exactly how much whipping cream to add to the caramel at the end? That cake looks delicious; my mouth is watering from just looking at the pictures. Very intrigued by the black pepper... I think I'm going to have to give this a try. Ooooh I like the caramel twist... and can picture a happy mess in the kitchen. this looks so delicious!! And the photos are amazing! Forgot to tell you in my email! This cake looks gorgeous and delicious! Thanks for your thoughts earlier today. it's my daughter-in-laws birthday this week, and she loves chocolate, so I think I might be making this for her! thanks - looks so yummy! Yep, that's the one I want tonight! I just want to jump into the picture and taste this chocolate cake. Crazy pictures, nice recipe! Je vais sûrement essayer cette recette. I've noticed in the recipe for the caramel that you cooked the sugar after adding the butter. I always cook the sugar before adding the fats. 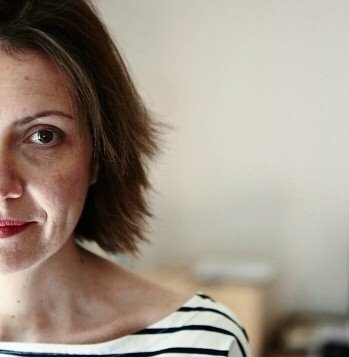 Does using your method make any difference to the final result or is it all the same in terms of flavour (assuming of course that you stick to the same proportions and ingredients)? Ozymandias: both methods work equally well.